The focal point of this lecture is the discussion on External Nose and Nasal Vestibule Diseases. Section one intents at elucidating about the Cellulitis and Nasal Deformities. The educator started off by talking about Cellulitis alongside Saddle Nose. Moreover, Hump Nose has been reported. Next in line, Crooked Nose has been brought into consideration. In the end, the educator concluded by mentioning about Deviated Nose and its treatment. The major aim of section two is to talk about Congenital Tumours of External Nose. Firstly, the educator has shed light on the type of Tumours. Moving ahead, those types have been discussed under separate heads. Congenital Tumours have been illustrated first. In addition to this, Dermoid with a Sinus and Encephalocele or Meningoencephalocele has been narrated as well. Conclusively, the educator expounded about Glioma. The prime objective of section three is an in-depth conversation on the Benign Tumours of External Nose. In the beginning, Benign Tumours and their Presentation has been brought under consideration. In the end, the educator winded up by bringing a slow-growing benign tumour termed as Rhinophyma under debate. Section four accommodates Malignant Tumours of External Nose. In the start, Basal Cell Carcinoma has been explicated. Following this, Squamous Cell Carcinoma has been highlighted as well. In the end, the section has been wrapped up by a mention of superficially spreading type or nodular invasive type called Melanoma. Section five emphasizes on the various Diseases of Nasal Vestibule. Primarily, Furuncle or Boil has been conversed about. Furthermore, Vestibulitis and Stenosis and Atresia of Nares has been communicated. 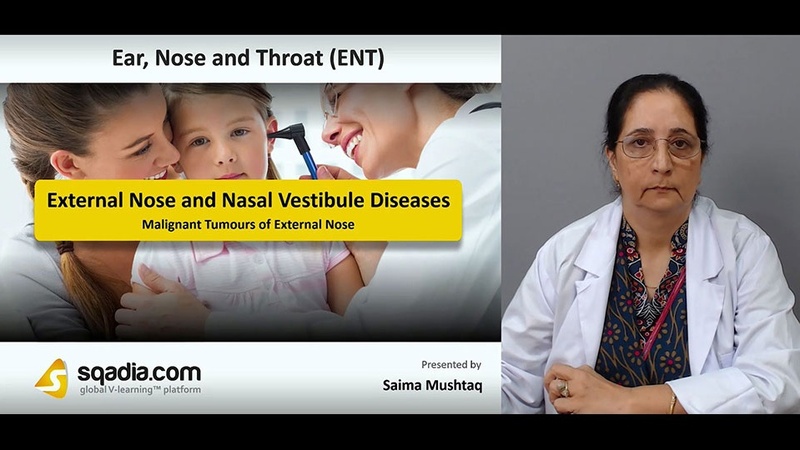 In the end, the educator concluded by deliberating about Tumours which encompass Nasoalveolar cyst, Papilloma or wart and Squamous cell carcinoma.